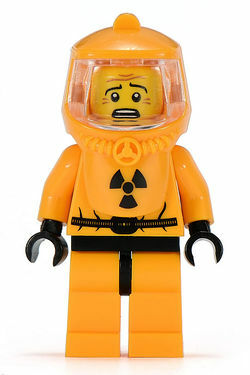 Hazmat Guy is a Collectable Minifigure released in 2011 in 8804 Minifigures Series 4. Hazmat Guy wears a yellow-orange Haz-Mat suit that is similar to the one worn by Radium. The headgear is a new piece which comes with a clear visor built in. It also has a black trefoil icon, the symbol for radioactivity, on the bottom. He has a black spray gun with a tube that attaches to his back. When you’ve got a bad case of mysterious glowing goo in your city, the hard-working Hazmat Guy is just the fellow to call. Whether the job involves searching the sewers for mutant sludge or cleaning up after giant radioactive chickens from outer space, he’s always ready to put on his airtight protective suit, grab his hi-tech equipment, and make the streets safe and tidy once more. Of course, when you get sent into dangerous situations to handle hazardous materials every day, you’re bound to get a little jittery. Although he never backs away from an emergency, the Hazmat Guy is always nervous that this is the one time his gear won’t work. After all, with all of the crazy substances he’s been exposed to, it’s a wonder he hasn’t grown an extra face on the other side of his head! As a joke, the CGI for the Hazmat Guy has a face on the right side of his head. The Hazmat Guy appears in The LEGO Movie, as a Master Builder and assumed resident of Cloud Cuckoo Land.